The move from the darkroom to digital may have saved you thousands of dollars in film and processing costs (not to mention a reduction in possible environmental pollution), but has added a new set of challenges to the art and business of photography. Perhaps foremost among the problems presented by digital photography is noise. Those pesky red, green, and blue (or light and dark) specks in an image can ruin a digital photo. Noise is generally most prominent in shadow areas and against dark colors in your images. The higher the ISO setting on your camera, the more digital noise it will record. Use the lowest ISO setting that’s suitable for the environment in which you’re shooting. When you must use a high ISO (low light, moving subject), be prepared for digital noise. Using a tripod can also help keep the problem to a minimum. If you shoot Raw, reduce noise in Camera Raw. If you shoot JPEG, apply Camera Raw as a filter or use the Reduce Noise filter (under the Filter→Noise menu). As you see in this figure, Reduce Noise does a very good job of neutralizing the random red, green, and blue pixels while preserving detail in the image. Notice that Reduce Noise also offers a Remove JPEG Artifact option. When saving in the JPEG file format, you compromise between image quality and smaller file size. The smaller the file, the greater the likelihood of compression damage to your image. That damage generally shows itself as visible lines between blocks of pixels measuring eight pixels square. The Reduce Noise filter keeps your image sharp while eliminating RGB noise. 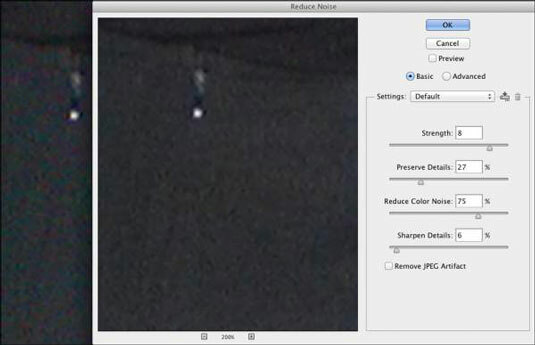 You’ll also find the Color Replacement tool very handy for noise reduction, especially in areas of rather uniform color. Option+click/Alt+click right in the area to set the foreground color; then simply paint away the digital noise. As you move from area to area in your image, Option+click/Alt+click to pick up a new foreground color. In addition to the red, green, and blue specks of digital noise, you might face luminance noise, the bright and dark specks sprinkled throughout your photo. Under the Filter→Noise menu, you can find the Despeckle command. 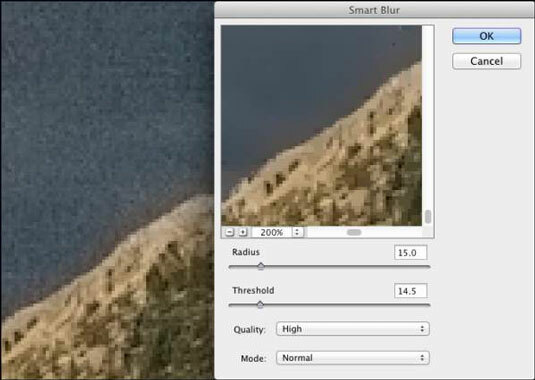 For supreme control over blurring, Smart Blur even lets you enter fractions for both the Radius and Threshold values.